FILE - U.S. astronaut Jack Fischer, above, and Russian cosmonaut Fyodor Yurchikhin, crew members of the mission to the International Space Station, wave near the rocket prior launch at the Russian-leased Baikonur cosmodrome, Kazakhstan, April 20, 2017. Despite tensions, sanctions and recriminations between the United States and Russia, two American astronauts will join a Russian cosmonaut blasting off Wednesday from Kazakhstan for the International Space Station. Even when things get nasty between the two countries, experts say the space program rarely suffers. The United States has depended entirely on Russia to deliver astronauts to the ISS since the end of the space shuttle program in 2011. After President Barack Obama imposed sanctions on Russia in 2014 for annexing Crimea, Russian Deputy Prime Minister Dmitry Rogozin suggested U.S. astronauts could get to the International Space Station by trampoline. FILE - The Soyuz-FG rocket booster with Soyuz MS-07 spaceship, carrying a new crew to the International Space Station, blasts off at the Russian-leased Baikonur cosmodrome, Kazakhstan, Dec. 17, 2017. "The politicians can be very cute and make their statements. But that doesn't seem to have had an impact on day-to-day work on the International Space Station," said Cathleen Lewis, a curator in the Space History Department at the National Air and Space Museum. U.S.-Russia cooperation in space dates back to the mid-1970s, during the Cold War. In the race to the moon, both sides suffered losses. Three U.S. astronauts died in the first Apollo mission in a fire on the launchpad in 1967; the Soviet Union lost a cosmonaut in a crash later that year. The two sides agreed to cooperate on a space project. In 1975, an American Apollo spacecraft and a Russian Soyuz spacecraft met in orbit, where cosmonauts and astronauts shook hands. In addition to the political achievement, it was a major engineering feat to make the two crafts compatible. 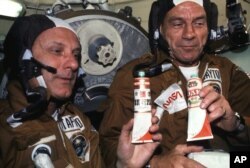 FILE - In the 1975 photo, astronauts Thomas P. Stafford, left, and Donald K. "Deke" Slayton hold containers of Soviet space food in the Soyuz Orbital Module during the joint Apollo-Soyuz Test Project docking mission. "That created a bond, but also the knowledge that we could do this, even in the height of the Cold War, and probably one of the worst periods of the Cold War," Lewis said. "Both sides could get together and do this, unperturbed by the politics around them." Today, the United States, Russia and 13 other countries collaborate on the International Space Station. Lewis says that kind of cooperation will likely be essential as humans reach beyond Earth. "It's going to take a lot of resources to make either the moon or Mars habitable for humans," she said. For now, collaboration is the only option for ISS crews. However, SpaceX and Boeing expect to bring human launch capability back to U.S. soil in a year or so.